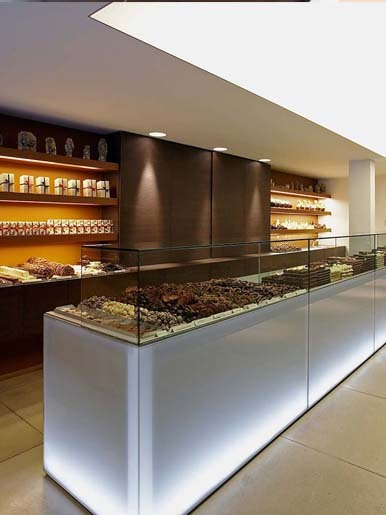 Since 1958, Chocolatier Depla has been holding court in the city centre of Bruges. With over fifty chocolate stores and seven artisanal chocolatiers, Bruges claims the title of the one and only world capital of chocolate. And the oldest artisanal chocolatier in Bruges is Chocolaterie Depla. But Bruges is so much more than just chocolate. Home to the highest number of michelin stars per inhabitant in the world, Bruges is exciting breeding ground for culinary talent who, amidst a vibrant cultural scene and together with the local merchants, honour a century-old tradition of creative entrepreneurship and courage. Very much to the liking of each visitor. Bruges is your number one choice as ideal getaway for a day of funshopping, a romantic weekend, a cultural trip, an active holiday or for business matters. The unique historic scenery is complementary to your visit. No better present, however, to bring home from Bruges than the chocolates by Pol Depla. Real chocolate, manually produced in the city centre. A member of the Guild of the Bruges Chocolatiers, Pol Depla is an official manufacturer of a unique chocolate called 'the Bruges Swan' (Brugs Swaentje): an artisanal chocolate in dark, milk or white version with a filling that refers to the grand past of the Lords of Gruuthuse and the tradition of the Bruges lace. The almond praliné is enriched with gruut spices and local lace biscuits which are called Kletskoppen or Dentelle de Bruges. If Bruges is the world capital of chocolate, Pol Depla is its emperor.